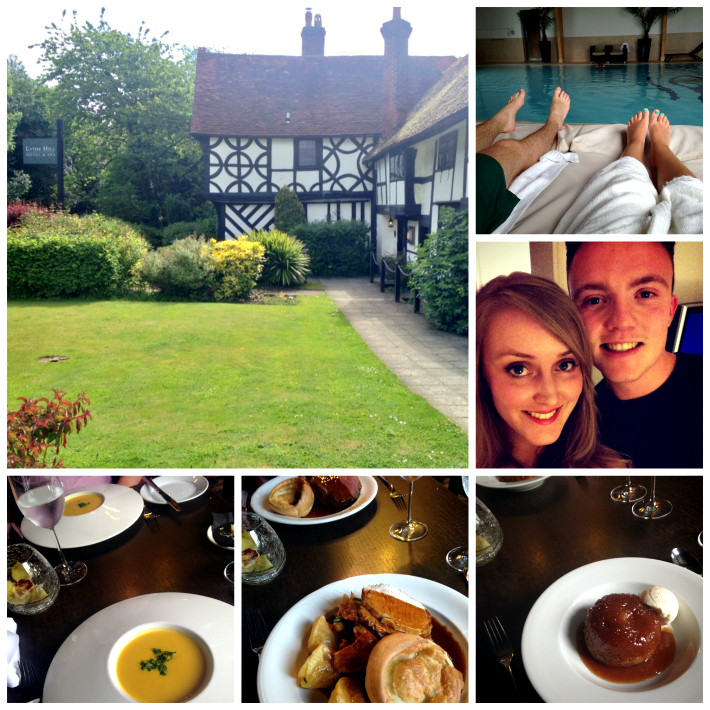 Last weekend, my boyfriend and I stayed at Lythe Hill Hotel and Spa in Haslemere. It was a birthday present from him so it's something we've been looking forward to for months. Sadly, as the weekend rolled around I managed to get an awful cold. Why is it that Summer colds always last longer?! I couldn't taste food and I had to take my inhaler every 4 hours but I was determined not to let it ruin our weekend. And it didn't! Reaching the hotel at 3pm for check-in, we were keen to get settled and go exploring. Our room was lovely! At first glance we thought it was tiny but we were mistaken - that was just the living room area with a sofa and T.V. There was a mini hallway with wardrobe space and a bathroom, and at the end was our bedroom. We didn't have an amazing view but it was cosy and a nice little space we could call home for 2 nights. Soon enough, we went on the lookout for lunch and managed to find the hotel's restaurant, situated in the 15th century Tudor house. We ate a chicken wrap with chips, overlooking the veranda and the lake in the distance. It was picturesque and a lovely way to start our weekend. We had decided we were eating out so we went on a little explore of Haslemere and pin pointed places we wanted to go over the weekend: a couple of pubs in the town centre and The Mulberry Inn just 5 minutes from our hotel, and owned by DJ Chris Evans. That night we ate Italian food and spent time in one of the pubs playing a kid's trivia game we found (and were tempted to take with us - it was just that good). On Sunday, we were looking forward to a 3 course roast dinner, even though I couldn't taste a thing, and time spent by the pool and in the sauna and steam room. What a great way to spend a Sunday! We alternated between the jacuzzi, pool, sauna and steam room before it was time we got ready for our roast at 1:30pm. The food was amazing (my boyfriend's words, obvs). For starters we had the Roasted Sweet Potato and Coconut Soup, followed by Roasted Loin of Free Range Somerset Pork and to finish we had the Sticky Toffee Pudding with Ice Cream. Just typing that makes me want to go back and have it again. We were so full after our delicious 3 courses that we went for a walk around the grounds (consisting of 22 acres) before we nestled down for an afternoon nap. We had reservations for The Mulberry Inn at 8, which we were looking forward to but dreading at the same time because we were so full. But we got our glad-rags on and persevered, and the food there was amazing too! The highlight of our trip was definitely the food and, of course, the people. I find that the further out of London you go, the nicer the people are. The hosts in the hotel's restaurant were so friendly each day, especially the man who greeted us at breakfast. Such lovely people in Haslemere! I've probably gone on for far too long - congrats if you've reached this far! After our meal on Sunday, we went back to our hotel room and watched the Britain's Got Talent final with tea, as we had drank far too much the night before. It was the perfect weekend with my favourite person!